Hong Kong Chinese New Year Parade 2019! 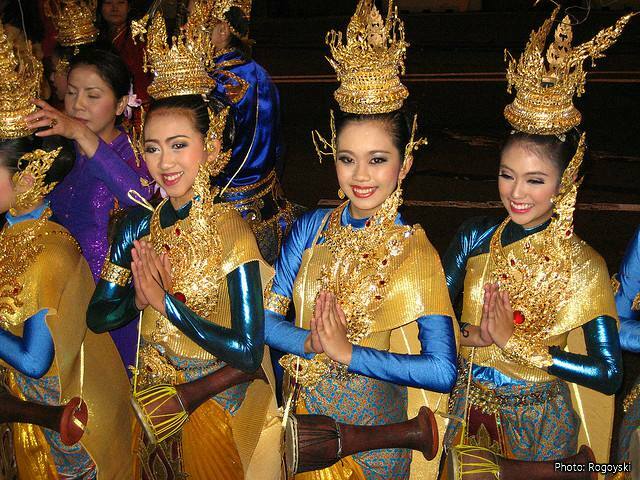 February 5, 2019 - 8:00 pm - Gung Hay Fat Choy! 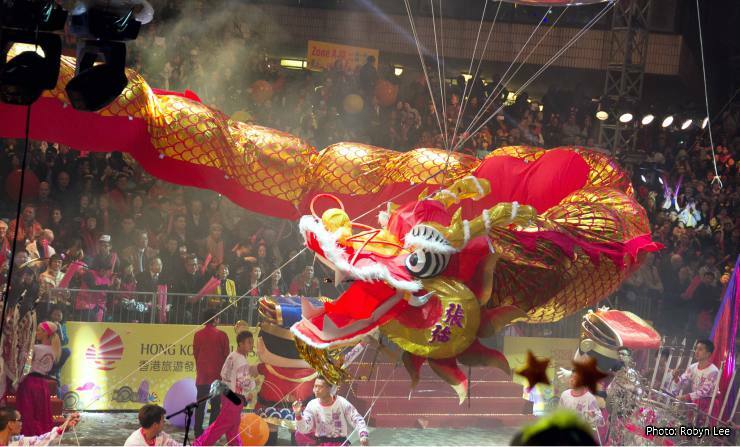 The Hong Kong Chinese New Year Parade is a classic featuring colorful floats, marching bands, troupes of acrobats, lively dragons, traditional Chinese dancers, international troupes from all over the world, drummers, Chinese lions, and of course, firecrackers. 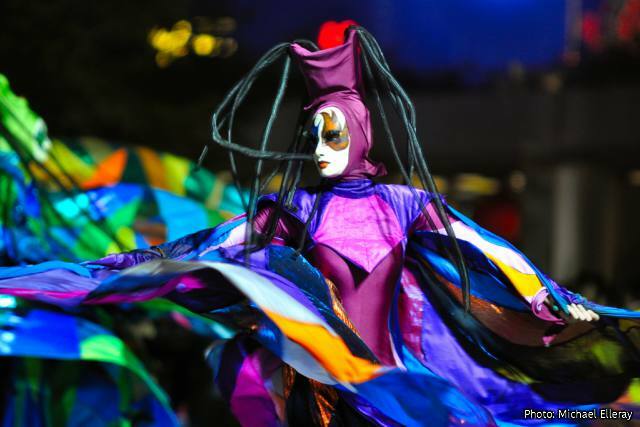 It is traditionally held on the evening of New Year's Day and winds through the streets of Tsim Sha Tsui on an hour and a half extravaganza of lively music, dance, acrobatics, folklore, martial arts and well-wishing to greet the new year. 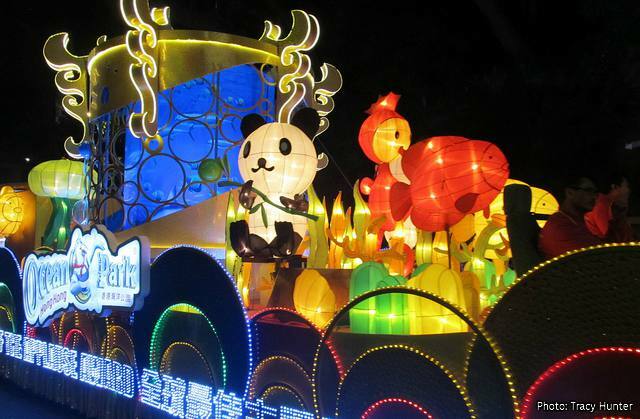 The parade features over 30 floats and performing troupes from the many organisations, which in the past has included Cathay Pacific, the official sponsor, Disneyland Hong Kong, Ocean Park and Ngong Ping 360 among many others. 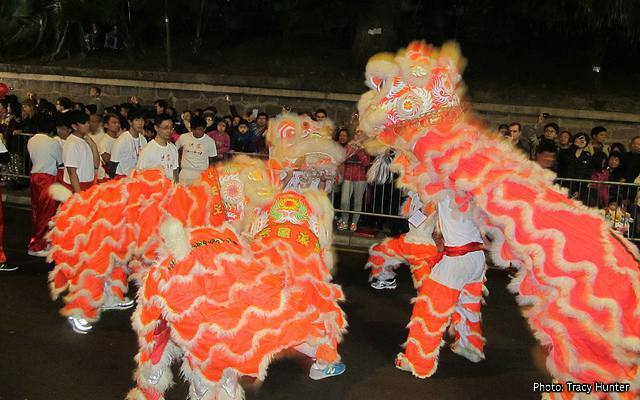 There will be traditional lion dancers along with the colorful dragons. There are as well a number of international guest performers anywhere from Peru, Thailand, to the Czech Republic and Japan. It is one big street party. Check it out! 2019 Parade: When, Where, How Much? When is the Chinese New Year Parade 2019? When? 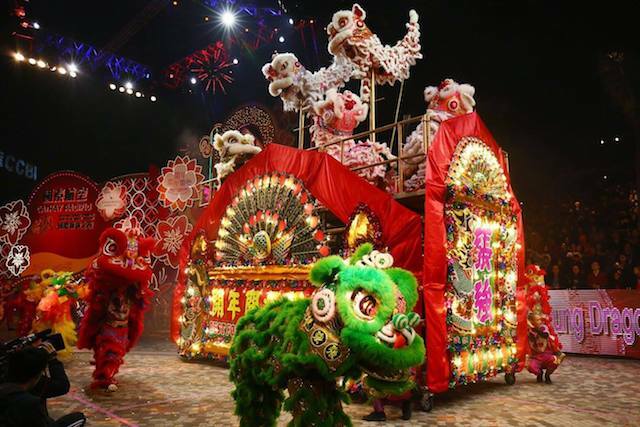 : On Lunar New Year's Day, February 5, 2019, official start time of the parade is 8:00 pm. Special spectators stands are set up for this event by the Hong Kong Cultural Center Piazza, the start point of the parade, and along some of the streets. There is an admission charge for these reserved seats. Otherwise, viewing along the parade route is free. Beware of "official looking" people that might try to charge you a "show fee" along the free parade route. Admission for the spectator stands: HK$480 / $450 / $300 per person for seats at the Hong Kong Cultural Centre Piazza stands and HK300 for seats at the Nathan Road stands. Stands open at 7:00 pm. 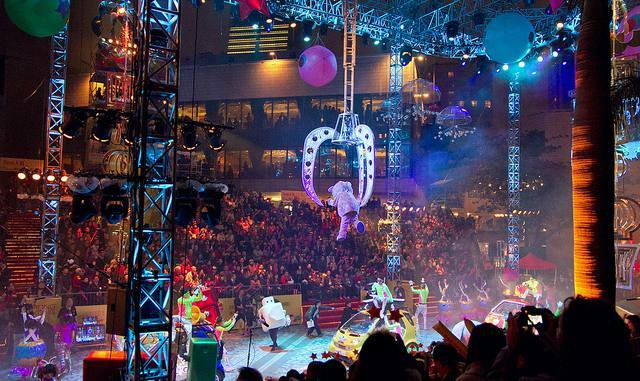 Tickets go on sale a couple of weeks before the parade, this year they go on sale on Saturday, January 26, 2019 and are available on a first-come-first-served basis, they normally sell out the very first day. You can buy the stand tickets at the HK Tourism Office at the Star Ferry in TST (Opening hours: 8am to 8pm daily) and there is normally a limit of 4 tickets per person. Call the Visitor Hotline for inquiries: +852 2508 1234. Regardless of the official start time, you want to make sure to come at least a couple of hours earlier and get a good spot as you can expect the streets will be full to capacity. Anyhow, the entertainment begins way before the start of the parade. 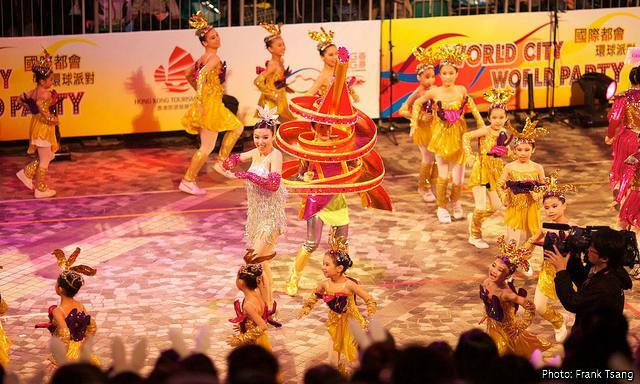 As early as 6:00pm you are likely to see the roving performers entertaining the early birds along the parade route with their lively shows, anything from dragon dances, acrobats in stilts, drummers, etc. 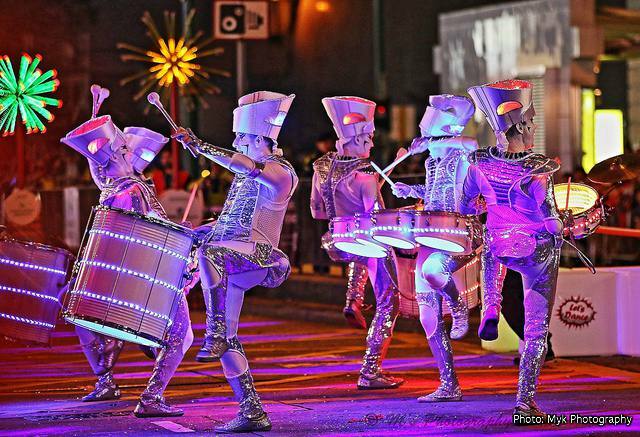 There will be street closures on the day of the parade as stands are being set up and near the time of the parade the route will be roped off. 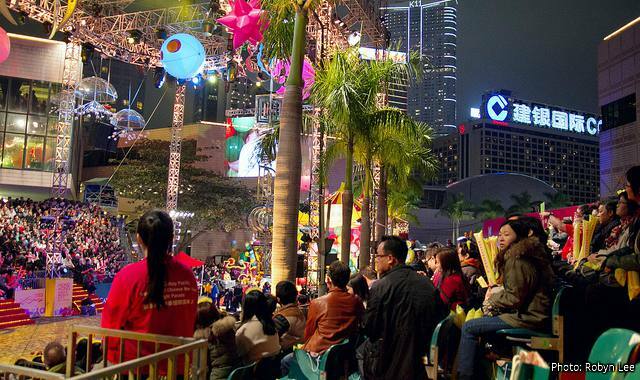 The first floats start from the Hong Kong Cultural Centre Piazza at 8:00 pm and the rest will follow for the next hour and a half or so. 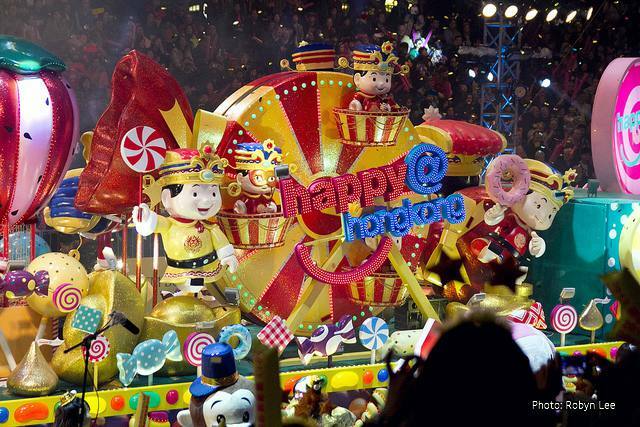 The last floats will reach the end point at around 10:30 pm. 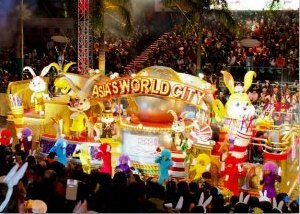 The Parade circles through the popular Tsim Sha Tsui Area, starting around the Hong Kong Cultural Centre near the waterfront. It then follows north along Canton Road, turning on Haiphong Road, and then South on Nathan Road to arrive finally back on the waterfront by Salisbury Road, ending in front of the Sheraton Hotel. This map gives you an idea of the parade route, exact beginning and ending points as well as the actual route may vary from year to year, but you can tell by where the streets are being roped off and the stands set up. 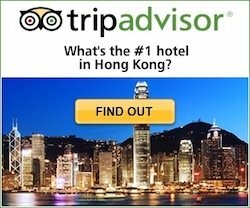 Getting there is quite convenient, MTR stations (Tsim Sha Tsui) and Star Ferry are nearby. These tours make it super easy and convenient, no figuring out where to go or dealing with sold-out stands. Let them handle the details, get picked up at one of several convenient spots/designated hotels and have a reserved seat at the spectator stands for the parade. And what's more, the tours combine some sightseeing, either around town or in the New Territories to check out some more of the celebrations in the countryside. 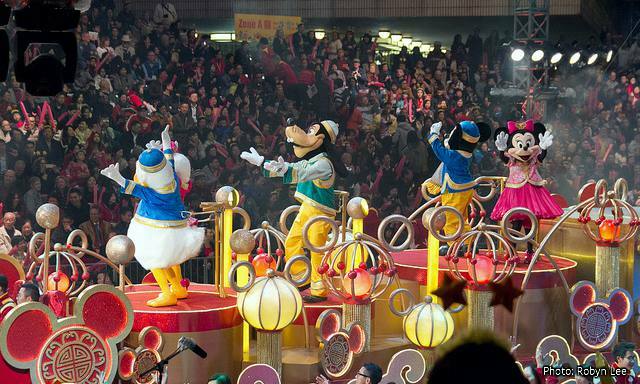 If you missed the parade on New Year's Day, the floats are normally on display at the Lam Tsuen Wishing Trees, where the Well-Wishing Festival celebrations will be well on their way and the groups that performed at the New Year's Parade will also be performing at the festival. 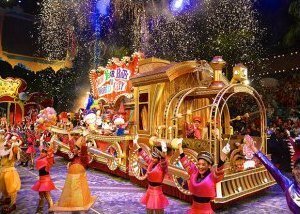 The Hong Kong Chinese New Year Parade together with the Fireworks are two of the city's most anticipated Chinese New Year events, don't miss them if you are in town!